What was once a web filled with code and scrolling text, the Internet is now the world’s largest conglomerate of images. And as visual content continues to rule, the number of images available online will only grow. But just because you can Google an image -- and technically copy or save it -- doesn’t mean the web is a free-for-all of visual data. Photographers and designers need to put food on the table. If every online image was available for free, there would be a lot more starving artists. Fortunately for them, copyrights apply in cyberspace just as in print. And anyone using an image without appropriate rights and permissions can find themselves in plenty of hot water. 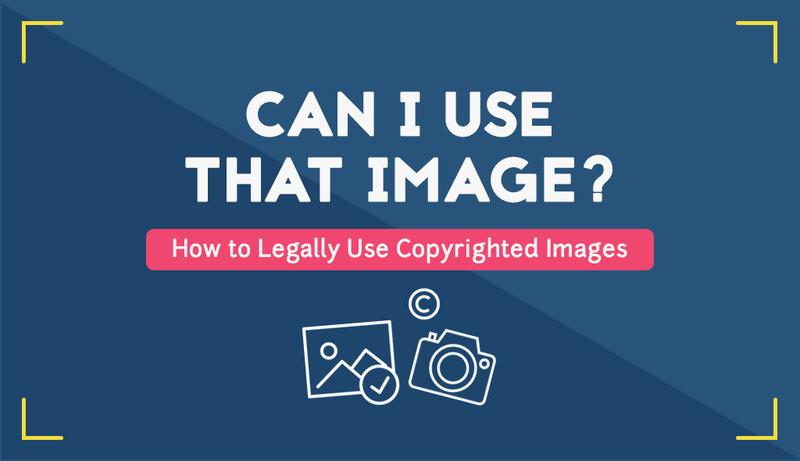 Understanding the ins and outs of image licensing and usage can save digital marketers, web designers and other content curators from unnecessary penalties, ranging from cease and desist notices to lawsuits and financial demands. 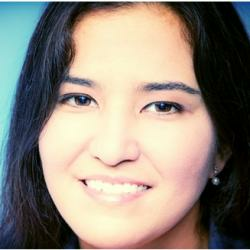 Want to be sure you properly use images in your online content? An ounce of prevention is worth a pound of cure. Just follow our five simple steps, and you just might save yourself a load of legal trouble. Unless you’ve taken the image yourself -- someone else owns the rights to use it. Whether the copyright owner provides free reign of the image’s use -- or allows it for a fee or under certain circumstances -- varies widely across the industry. Also known as contracted work, a flat-fee license relates to a single photo that is licensed and intended for one user. Refers to the purchase of a photo which can only be used one time and as specified by the license. 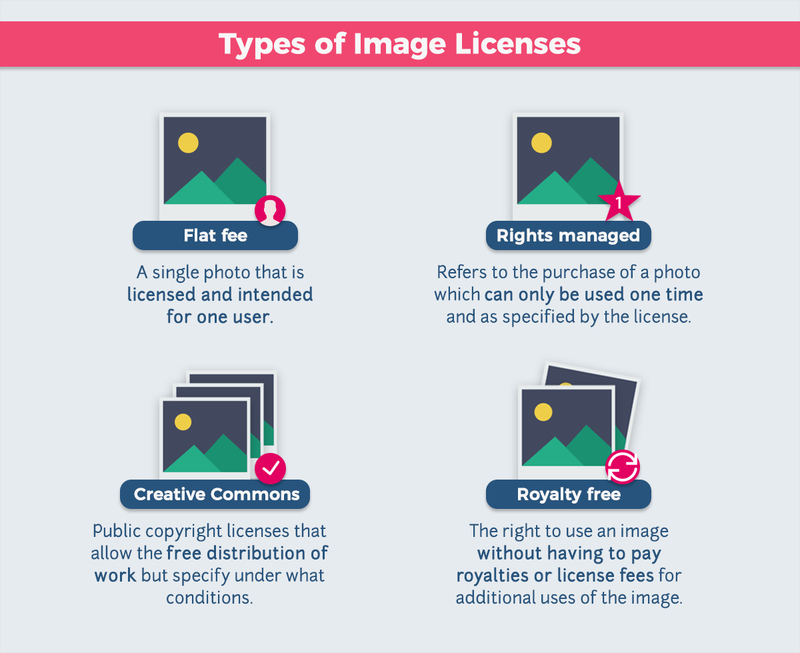 The royalty-free licensing model is the most popular type of license for stock photos and often the most affordable, although royalty free should not be confused with free from cost. Instead, the term refers to the absence of additional royalties for additional uses of the image. The only cost variable is generally the size of the image or image file provided. The Internet is full of amateur photography. But amateur doesn’t mean without copyright. 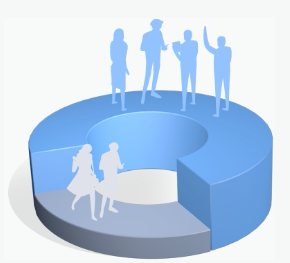 To help manage the sharing of copyrighted work, Creative Commons licenses were developed. The licenses allow copyright owners to freely share their work, but control the conditions under which it is used. 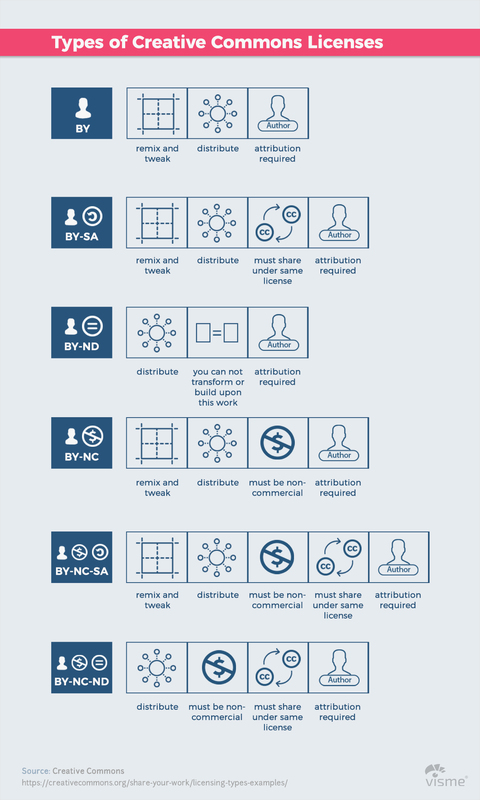 The Creative Commons organization manages six types of licenses that vary in their openness of use, ranging from allowing any type of use as long as the creator is attributed to only allowing personal use of the original work. This license allows others to distribute, modify and adapt the image, even commercially, as long as the copyright holder is credited. The license allows others to reuse, modify and adapt the work, even for commercial use, as long as the original copyright holder is credited, and any new creations are shared under identical terms -- i.e., share-alike. Often compared to open-source software licenses, any new works that use any part of the original image must carry the same Creative Commons license. CC BY-SA is most-commonly associated with Wikipedia. This license allows for the redistribution or content -- whether commercial or noncommercial -- as long as it is used unchanged and in whole, and the original copyright holder is accredited. In other words, no derivatives of the original work are allowed. This license allows others to use, modify and adapt works for non-commercial purposes only, provided the original creator is credited. Any new works that use any part of the original work must also be attributed to the original creator and be used non-commercially, although they do not have to license their own derivatives on the same terms. This license allows others to reuse, modify and adapt works for non-commercial use, as long as the original copyright holder is credited and new creations are licensed under identical terms as the original. The most restrictive of the Creative Commons licenses, content can be downloaded and shared with others as long as the copyright holder is credited, but images cannot be changed in any way or used commercially. Although it’s not a license, per se, public domain makes up a large portion of stock images. As the name suggests, the copyright is owned by the public, and images are free for anyone to use, reuse, modify, adapt and distribute. While the images are copyright-free, it’s still professional courtesy to attribute the work’s original creator whenever possible. 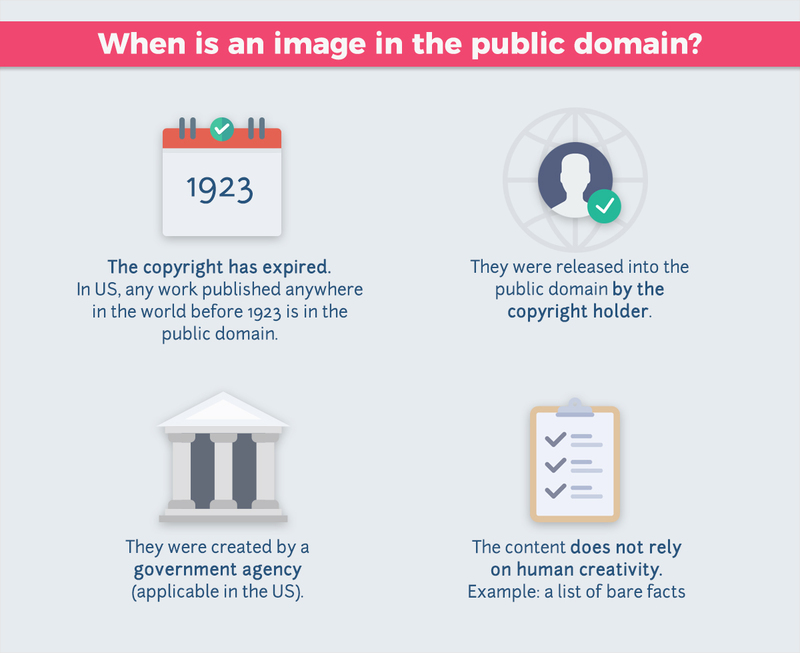 How Do You Know if Something Is in the Public Domain? Their copyright has expired. In the United States, any work published anywhere in the world prior to Jan. 1, 1923, is in the public domain. Other countries may follow different policies on length of copyrights. They were released into the public domain by the copyright holder. In such cases, the copyright holder needs only release their work with an accompanying statement releasing all rights to the work. Images licensed under the Creative Commons CC designation are released to the public domain. They are ineligible for copyright protection. In the United States, works created by a government agency are not eligible for copyright protection and can be used by the public. Content that does not rely on human creativity is also ineligible for copyright. A list of bare facts will belong to the public domain, while an article based on those facts and an infographic referencing them are both copyright protected. Identifying the types of image licenses is only effective if a user also understands the ways in which content can be used. Using an image that is licensed for non-commercial use in a business context can bring negative consequences, just like failing to pay for its use. As previously mentioned, some licenses allow the reuse of images for non-commercial purposes only. But non-commercial is a broader category than the name may suggest. Obviously, the use of content for any for-profit advertising and marketing purpose is commercial. But so is creating an internal company brochure, updating a blog and creating a social media profile. A blogger who doesn’t sell ads or make any profit may be able to claim non-commercial use, but only if no type of commerce occurs or even appears on the website. If anyone is financially profiting from the content in any way, it’s almost certainly for commercial use. So what types of use are considered non-commercial? Some images are released for editorial use only and only can be used to illustrate news-related stories. U.S. 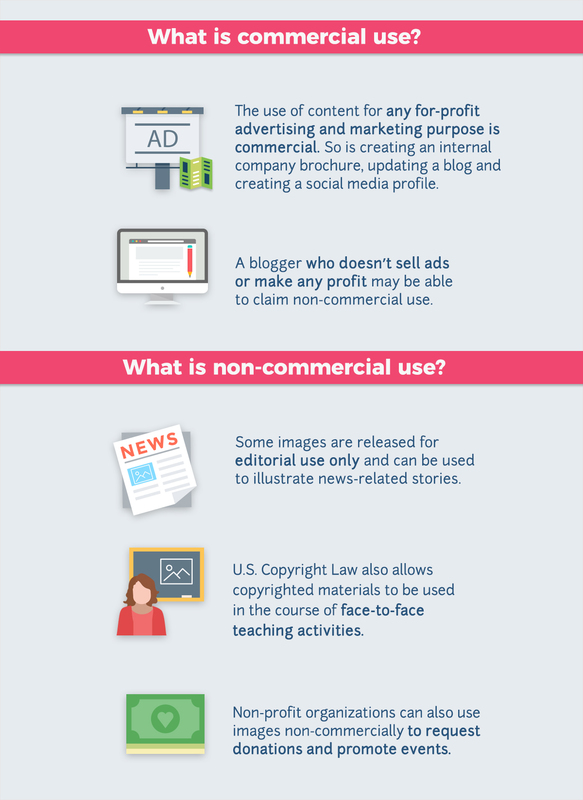 Copyright Law also allows copyrighted materials to be used in the course of face-to-face teaching activities, so teachers and students can use copyrighted images for classroom presentations, assignments and learning aids. Non-profit organizations can also use images non-commercially to request donations and promote events. 5 What is Fair Use? Fair use is a doctrine originating in U.S. law that permits limited use of copyrighted material without permission from the copyright holder. The copyright limitation is intended to balance the interests of copyright holders with the public interest by allowing certain limited uses that could otherwise be considered infringement. U.S. courts have cited as examples of fair use such as commentary, search engines, criticism, parody, news reporting, scholarship and research. Unfortunately, the doctrine still leaves a giant gray area and there is never a guarantee that your use will qualify as fair. In fact, the only way to get a definitive answer on whether or not a particular use is “fair” is to have the issue resolved in court. The nature of the copyrighted work — courts grant more leeway to copies of factual works such as biographies than from fictional works such as plays or novels. The amount and substantiality of the portion used in relation to the copyrighted work as a whole — sometimes the amount of material copied is so small the court permits it without even conducting a fair-use analysis. The impact the use bears upon the potential market for or value of the copyrighted work — whether your use deprives the copyright owner of income or undermines a new or potential market for the copyrighted work. To get a better idea if the use of a specific image may be considered fair, you can also fill out the checklist above. Since there is no arithmetic method for determining fair use, these should be used as general guidelines in your fair use analysis and do not, by any means, constitute legal advice. Copyright infringement occurs when any party uses a whole or part of an image without permission, beyond the scope of a permission or license, adapting the image without permission or even asking another artist to identically recreate the image. It’s a crime, and it can occur even unintentionally, which is why understanding image licensing and usage rules is vital to today’s digital marketers and visual content designers. If a website designer is hired by a company, and that designer steals images without the company’s knowledge, everyone is still guilty. Those who break copyright law can incur monetary damages, lawsuits, costly legal fees and even criminal charges, depending on the severity of the theft. As with most of life, an ounce of prevention is worth a pound of cure. Have any other questions we haven't answered on how to properly use copyrighted material? Let us know in the comments section below! This is a very clear and great article, important for bloggers and anyone doing marketing. There are many websites giving pictures for free like Picjumbo, paprikaphoto, jaymantri and many other. They are different than the usual “Stock photo”, more personal and full of passion, often created by one photographer. Thanks for the feedback, Nicolas! We’re so glad you found the article useful. Thanks also for the insight. You can find many of the free resources you mentioned in our post, https://visme.co/blog/free-design-resources/. Thank you for sharing! Loved the infographic. I’m so glad you enjoyed it, Claire! Really useful article. I will share it with my business students. Thank you. Thanks for the feedback, C! So glad you found it a useful resource! I would actually go further on this — as the Stanford site that Lyn links to makes clear, “fair use” is an after-the-fact legal *defense* against a copyright infringement claim, not a plug-and-play concept that can be applied before the fact to determine when you don’t need permission to use copyrighted works. Depending on the use the material is being put to, a fair-use rationale can backfire in court if the judge doesn’t agree that the usage is fair use — and the four factors allow a lot of scope for subjectivity. To me, the infographic (with loose language like “eligible for fair use”) does a poor job in making this clear. Always better, when possible, to at least try to obtain permission. Thanks for the feedback, Stewart. We’ve updated the article to include additional details on what courts typically consider “fair use,” but given that it’s so subjective, we’ve tried to also warn readers against relying on it if unsure. After all, the final decision can only be made in court – and I’m no judge! We appreciate your feedback, Lyn, and we’ve updated the article and the infographic to include additional information on fair use. What are yhe rules on using an image that you have made changes to? Hi Lee. We’ve updated the flow chart in the first section to include a fair use checklist which appears when you click on that option. Also, there is a new section explaining fair use toward end of post. You should correct your comment about government materials. Though publications by the US government when prepared by government officials are in the public domain, many documents on federal websites are prepared by contractors or other third parties who are the legal copyright holders or have simply assigned their copyrights to the US government. The same rule applies to state and county governments. State regulations are in the public domain but documents prepared by state employees under the supervision of an agency or even a contractor might not be depending on the state’s policies. Thus, even though state regulations would be in the public domain, a collection of annotations about those laws might not be. Graphs, photos, artwork, and text may be protected by a third party’s copyright though it has become part of a government sponsored publication. Thanks for pointing this out, Denise. It’s been added to the section on public domain. Very nice and very useful article! You did an excellent job of compiling the information. It is true that this can be a problem if we do not know what is right and what is not. Thank you for your work. It really depends, though, on the purpose of use. As a photographer or videographer, it is the best not to use not self-made content. The greater popularitiy one has the bigger likeliness that someone else will go after his/her work. As an advice of my experience, go and shoot as many as you need to be at the top. But avoid showing someone else’s work as yours. Most successful people don’t do that. What about creating a painting without making any profit (not selling it, not for commercial use) and putting it on your website mentioning the photographer? You should make it clear that if the person that took the photo has died, his or her HEIRS inherit the copyright for 70 years after the death of the person who photographed the photo. Just because the creator is deceased, this doesn’t mean the photo is in the public domain. Thanks for the feedback, Joan. We have updated the flowchart to specify that if 70 years has passed since the creator died and no one else owns the rights (as indicated above), then the image may be in the public domain.